Sinus ear pain is the result of swollen nasal cavities that are placing excessive pressure on the inner or middle ear. You may also develop a secondary ear infection resulting from sinusitis that can cause severe pain throughout the head and ears. If you have pain in your head and ears, make an appointment with your doctor for further evaluation. Garlic is a natural anti-inflammatory and antibiotic that can treat sinus ear pain and infections. Sinus ear pain is caused by sinus headaches, or sinus pressure. When the sinuses get infected, they swell, placing excessive pressure on the surrounding areas of the head. Sinus pressure pain is commonly felt in the eyes, forehead, temples, behind the cheeks and in the ears. If you experience pain in your ear, you should talk to your doctor to determine if you have an exclusive sinus infection or if you've developed a secondary ear infection. The common symptoms of a sinus infection that affects the ears are nasal congestion, sinus pressure, headaches, a low-grade fever, thick nasal discharge, postnasal drip and body chills. If you develop swelling in your forehead or notice bloody discharge from you nose or ears, call your doctor, as this may be a sign of a more serious condition. 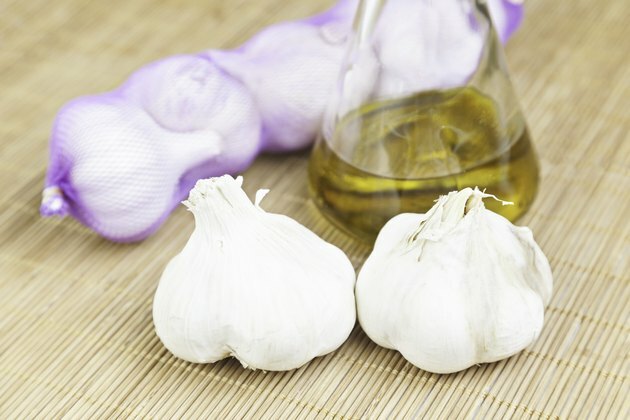 Garlic oil is sold in supplement pill form and is taken orally. Garlic contains naturally occurring anti-inflammatory and antibacterial properties that may help cure a sinus and ear infection. Garlic can help reduce inflammation in the sinuses and inner ear, providing relief to sinus pressure and pain. If the infection is caused by bacteria, the supplement will help the body kill it. Talk to your doctor for the recommended dose for your condition. Garlic may interact with certain drugs and is not recommended for people with a blood clotting disorder or women who are pregnant, may become pregnant or are breastfeeding. Common side effects of taking garlic oil are eczema, skin rashes, mouth burning, nausea, vomiting, sweating, diarrhea and light-headedness. Your doctor may recommend other treatments, including the use of a decongestant and pain reliever to help alleviate symptoms. Prescribed drugs, such as corticosteroid nasal sprays and antibiotics, may also be used to treat sinus ear pain from infections.